Stolen Yellow Ferrari 488 Found With New Paintjob in Mexico! - Muscle Cars Zone! Stolen Yellow Ferrari 488 Found With New Paintjob in Mexico! When you`re rich enough to get yourself a yellow Ferrari 488, you probably want to keep a close eye on it. That`s exactly what this one guy in Mexico tried to do, but apparently he failed miserably as the luxurious car was stolen by some, as the story turns out, pretty amateur thieves. 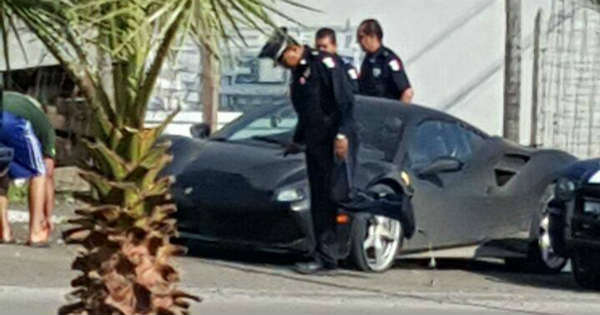 Apparently, this shiny new GTB was reported as stolen by its owner last week, and the police department took the case seriously, as this is one of the few rare exemplars of this car in Mexico. As they searched for the vehicle, they came upon a startling discovery in an empty lot, not very far from the owner`s home – a matte black 488, just sitting there like it`s no big deal and like any regular abandoned car. Luckily, the police immediately got wind of the plan of the people that stole the yellow Ferrari 488 and notified the owner, who recognized it as his own sports car, but with a new, matte black paintjob. By some miracle, the Ferrari was not damaged at all, just a little dusty from staying out without any protection for so long. Anyway, this story seems to have had a happy ending and quite a peaceful resolution, but I can`t help but wonder – what were those guys thinking, just leaving a car worth a few hundred thousand dollars in a parking lot. Was it waiting to be picked up? Was it left there intentionally, or was it completely forgotten amidst other priorities? I guess we`ll never know! At last, check out the best Ferraris of all time!